Blackpool’s South Pier opened in 1893 and was originally called Victoria Pier. 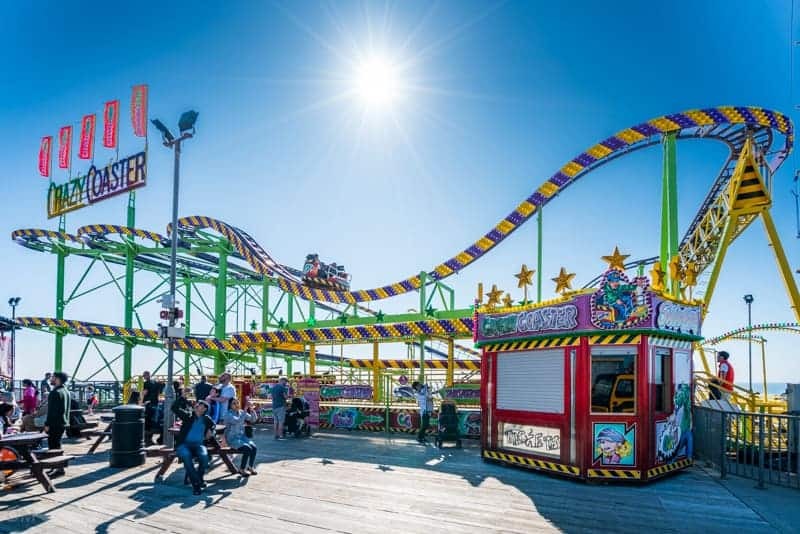 It is situated opposite the Pleasure Beach and reflects its funfair atmosphere. Adrenaline Zone offers a number of extreme rides. 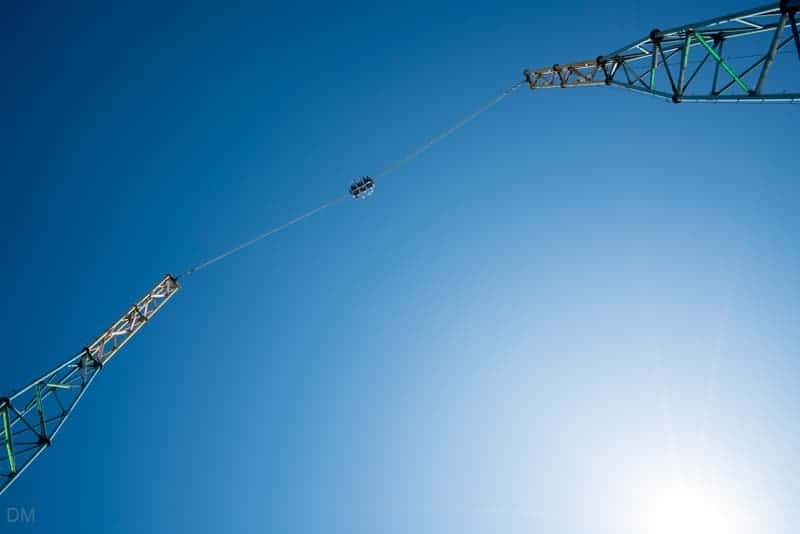 Skyscreamer is a reverse bungee jump. Two riders are seated into a ball and catapulted into the air at around 100 miles per hour. Skycoaster is a free-fall swing ride that swoops out over the sea. These are the most expensive rides on the pier. They cost £15 per person at the time of our last visit (May 2018). The rest of the rides at South Pier are considerably cheaper (and less terrifying). The Crazy Coaster was installed in 2018. The spinning wild mouse ride is located right at the end of the pier. 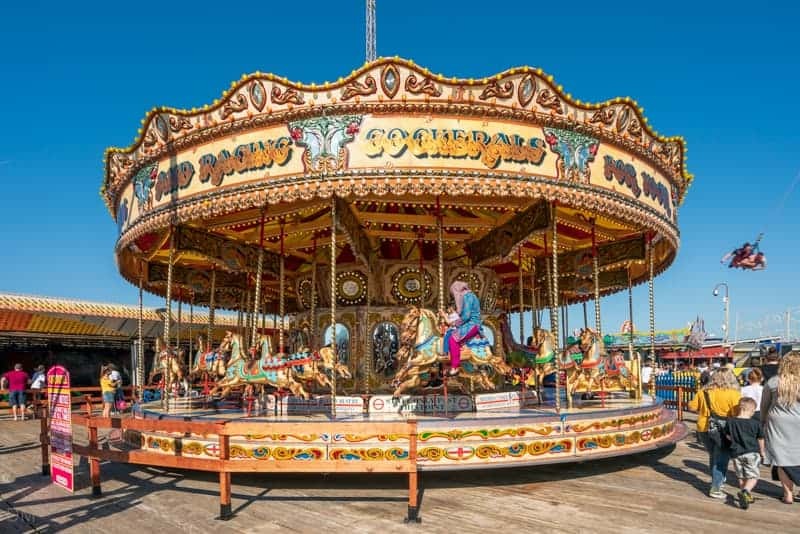 Other rides include the Log Flume, Breakdance, Waltzer, Dodgems, and Carousel. There are several rides suitable for young children. 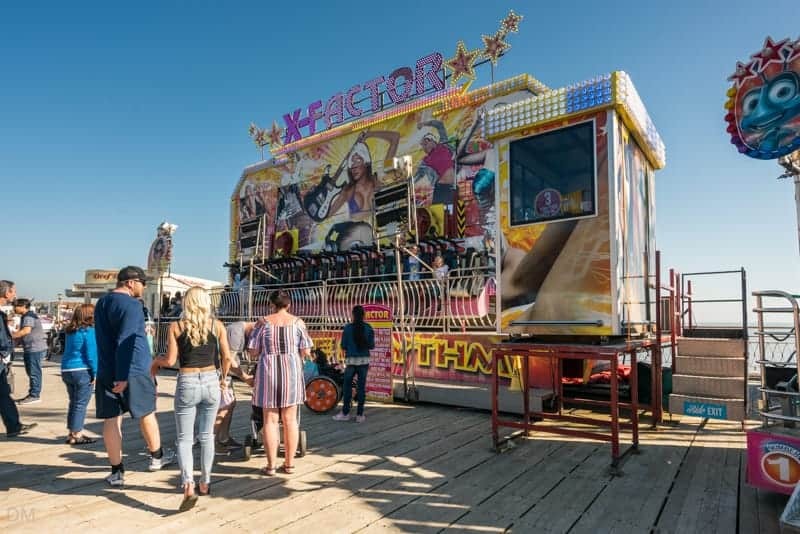 Tickets for the rides can be purchased from several kiosks around the pier. At the time of our last visit (May 2018) tickets cost £1 each. Most rides required two or three tickets. The Laughing Donkey is a family and sports bar. It shows live sports on big screens (including Premiership football). It also offers a busy entertainment programme that includes singers, comedians, and magicians. The beer garden offers great views of the sea and beach. There’s a large amusement arcade at the landside end of the pier. It features video games (retro and modern), pinball machines, and games of chance (coin pushers etc.). Blackpool South Pier is located on the Promenade (postcode FY4 1BB), right next to Pleasure Beach and Sandcastle Waterpark. 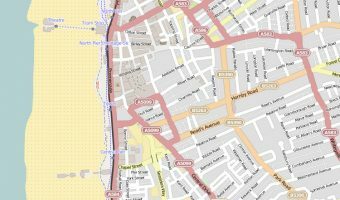 The closest Blackpool Council car park is South Beach. The nearest Blackpool Tram stop is South Pier. The closest train station is Blackpool South. 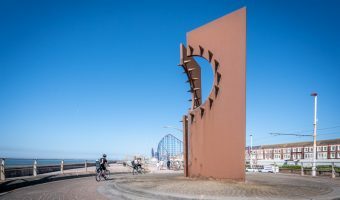 For the latest opening times check the official South Pier Blackpool Facebook page (see information box below). 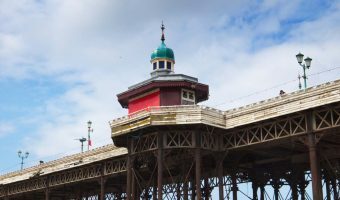 South Pier is owned and managed by the Blackpool Pier Company (Sedgwick family). The company also owns the town’s other piers; Central Pier and North Pier. Blackpool South Train Station (0.4 miles) - Train station on the South Shore. Blackpool Pleasure Beach Train Station (0.5 miles) - Train station near Blackpool Pleasure Beach. Map showing location of South Pier. Love the bungee jumping at the South Pier. Terrifying but worthwhile. The South Pier is the place in Blackpool. I’ve got to say it is amazing! We have been there loads of times and we never get tired of it. Go there, you will LOVE IT SO MUCH! My partner works on South Pier and they open at Easter and close the second week in November. The rides are brilliant, especially the Sky Coaster. I hate heights but that gets me every time. I went on the sling shot. It was so scary. We went to the South Pier for dinner and then spent £9 on drinks. We asked for a drop of water so my 4 year old son could take his heart tablet and were refused. They said they only had washing up water. By the taste of the coffee I believe them. South Pier is the best pier in Blackpool. My favourite ride is definitely the Storm Chaser. South Pier is mega good. I love it there and every year me and my family go there. I think that the rides are brilliant especially the bungee jump. I MUST ADMIT THE SOUTH PIER IS GOOD AND I WILL BE BACK TO IT AT EASTER. CAN’T WAIT. 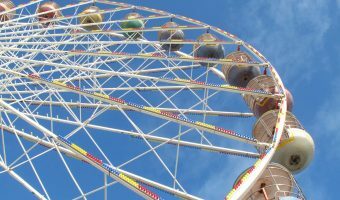 The pier is open all year but the rides don’t open until around Easter. There’s also a ‘Wild Mouse’ type ride here, but it isn’t as good as the one at Blackpool Pleasure Beach. Comtemporary works of art on the Promenade.